The Mandukya Upanishad is the shortest among the principle Upanishads having just twelve mantras. 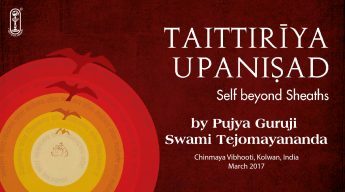 However, it presents the quintessence of our entire teaching of Upanishads. It analyses the entire range of human consciousness in the three states of waking (jagrata), dream (svapna), and dreamless sleep (sushupti), which are common to all human beings. It asserts unequivocally that the Absolute Reality is non-dual (advaita) and attributeless (nirguna). It provides a unique sadhana through the use of the symbol AUM to reach Oneself. 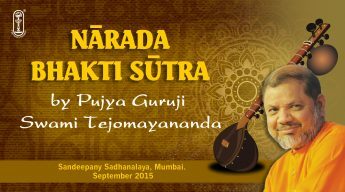 Pujya Guruji’s interpretations of Narada Bhakti Sutra dance with the nuances of an ecstatic and enduring relationship with the Lord of one’s heart that becomes the bedrock of a devotees’ life. This divine love is all-consuming, yet purging and freeing in its impact. The devotee trusts the Lord like a friend, cherishes Him like a child, and is faithful to Him like a wife. Where then is the need or the place for any other worldly relationship? Joy or sorrow, it is the Lord alone for him. He will play, pray, fight and frolic only with the Lord in his hearts shrine. Go for it! Get engulfed by a relationship that lasts lifetime, riding on giant waves of beatific beauty! 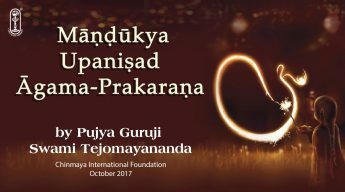 These nine forms of devotion are elaborated more in his lyrical work by Pujya Guruji Swami Tejomayananda. Listening to the explanations, each and everyone will be inspired to seek and meet the Lord of one’s own heart. 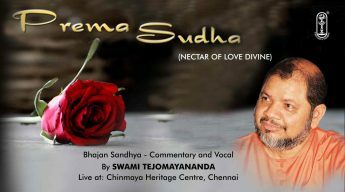 Bhajans in the divine voice of Swami Tejomayananda. 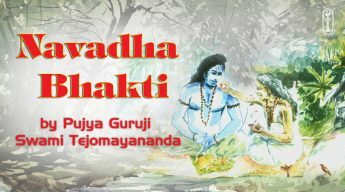 Songs composed by Swami Tejomayananda, Tuslidas and other saints. 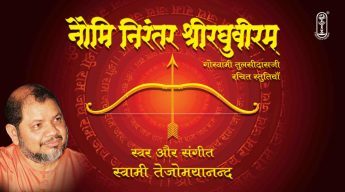 There is a beautiful stotram of Bhagavan Adi Shankaracharyaji titled Hari Meede Stotram. 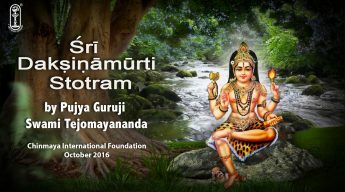 Inspired by that stotram, Rama Hare stotram has been composed Pujya Guruji Swami Tejomayananda. In this composition, in every line there is Rama Hare, therefore it is called Rama Hare Stotram. The word ‘stotram’ is praise or a hymn in praise of the Lord. 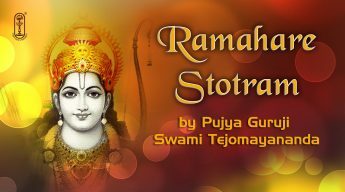 Rama Hare stotram is in praise of Rama who Himself is Hari. The idea is, all of us without any exception, work for two things in life: dukha nivrtti – elimination of sorrow, and atyantika sukha prapti – attainment of happiness. What does Hari mean? Hari means one who takes away. Hari takes away our ignorance, our sorrows, our sufferings, our negativities. Hari – Harati iti Harih; Raamah – that word comes from the verbal root called ‘Rama’. Rama means to revel, to sport, to delight. And therefore Rama is the one who delights us. And what delights us is only joy/ananda alone. Wherever we experience some kind of ananda/joy, our mind gets attracted to that. A narrow vision is divisive, a noble vision is unifying but a divine vision is all-inclusive, infinite and liberating. Saddarshanam of Bhagavan Ramana Maharshi guides us to attain a divine ‘Vision of Truth’ by searching the very core of our being and inquiring into the root of who we really are. Swami Tejomayananda’s coherent narration guides us in our inner search with profound concepts put into thought provoking questions and declarations. The Song of Eternity — A dialogue between Lord Krishna, the divine in us, and Arjuna, the symbol of our deluded ego (jeevabhava) — How our mental confusion, delusion, desires, passions, etc. destroy our inner peace and how to overcome them is indicated — Geeta is a consolation to the bereaved, disillusioned, disappointed, morally slipped and spiritually fallen — It is a guidance to a politician, businessman and teenagers. The grand vision of the Universe and all pervasiveness of God indicated — The secret of action pointed out — How one can step up efficiency, inner peace, concentration, usefulness to others and joy to himself is indicated — Tips for effective meditation given — Nature of the perfect man pointed out — Science of spiritual growth, spiritual fall and impotent stagnation is indicated — The beauty of the spirit and the ways of reaching the divine goal are indicated and that is the glory of Geeta. All of us have an inborn desire for peace and happiness. But there are times in life that we experience so much inner conflict that peaceful existence just does not seem possible. It is at such times that many of us turn towards the sacred scriptures of the world for guidance. Among the ancient scriptures of India, the Bhagavad Gita holds a special place. Rich with spiritual insights and wisdom its message is universal. For centuries it has been a vast source of inspiration to all those seeking spiritual guidance. This illuminating discourse in Hindi by Swami Tejomayananda on the entire Bhagavad Gita shows how inner wisdom enables us to maintain mental balance while dynamically acting in the world. His teachings are profound, yet simple, but above all relevant in today’s world. He guides us on how to base our choices on the vision of Oneness and Truth, so that we can revitalize and enliven every aspect of our lives. Shri Dakshinamurti Stotram, written by Shri Adi Shankaracharya, expounds Advaita Vedanta. It is arguably the shortest of any of his works. However, in its philosophic import, it is one of his most inspired works. In a compilation of ten stanzas there is a concise and vivid description of the philosophical significance of the form of Shiva, giving the very essence of the Indian idea of epistemology. It differs from every other attempt in a very basic sense, in that it is holistic rather than purely reductionist. Location: Adi Shankara Nilayam, Chinmaya International Foundation, Veliyanad. Shrimad Bhagavata is renowned as one of the greatest compositions in Sanskrit Literature. This is the 18th Purana composed by Maharishi Veda-Vyasa, which stands unparalleled in its distinct and resplendent exaltation of devotion to God, revealing throughout the quintessence of Vedantic teachings. 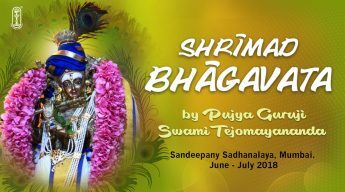 Masterfully profound and delightfully enchanting, Shrimad Bhagavata abounds in work-paintings of the supreme Lord’s wondrous and endearing avatars, divine sports and devotees – paintings that kindle, intensity and establish devotion in one’s heart. 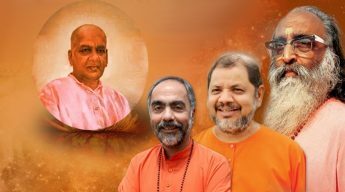 This spring of devotion leads one to satsang, to the Guru and to teachings that unveil one’s essential nature of Brahman. This video series are talks given to the 17th batch of Sandeepany Sadhanalya Vedanta students. Generally Vedanta is considered serious, difficult, very high and very dry and that it leaves us high and dry without any support. 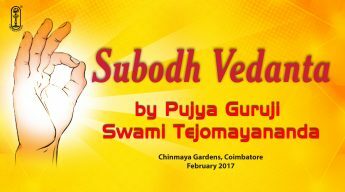 Thus the important role of ‘Vedanta Made Easy’ (Subodha Vedänta). This dialogue between a disciple and his Guru covers important topics of life like the Nature of the Self, Proof of God and Purpose of Creation. It shows us that Vedanta is easy, interesting and practical and it is possible to free ourselves from the ‘world wide-spread web’ of maya. 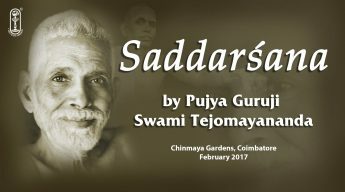 Swami Tejomayanandaji expounds on his own composition in an easy-to-understand, introspective style peppered with humour. It inspires any listener to embark on an inward journey towards peace and happiness. To Know more about Us!